Directory list of warehousing services from around the world. 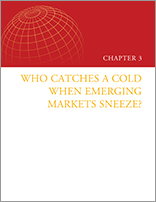 Who Catches A Cold When Emerging Markets Sneeze? Since 2010, a synchronous growth slowdown has been underway in emerging markets. Given the size and integration with the global economy of the largest emerging markets, the BRICS (Brazil, Russian Federation, India, China, and South Africa), a slowdown in these economies could have significant spillovers to the rest of the world through trade and financial flows, according to the January 2016 issue of Global Economics Prospects.